While in college, studying some lovely Art History, my friend and I were asked by another student who was conducting some survey what our favorite food was. We both looked incredibly sheepish, wishing we had exciting answers. She said doughnuts. I said pizza. No lobster bisque. No fois gras. Doughnuts. Pizza. This same friend and I made a 4am doughnut run in San Francisco and bought fresh, warm doughnuts with change from my car seats. When I've had a rough day at work (or a great day at work!) we make pizza. I could eat pizza everyday, forever. In a large bowl, add yeast, warm water, oil and salt. Mix the flours together and knead them into the liquid mixture - by hand or with a stand mixer fitted with the dough hook. Let the dough rise for 30-40 minutes. Decorate your pizza with whatever sounds good to you, and bake for 15-20 minutes. I like to turn on the low broiler flame for the last 2 minutes of baking to really crisp up the edges. 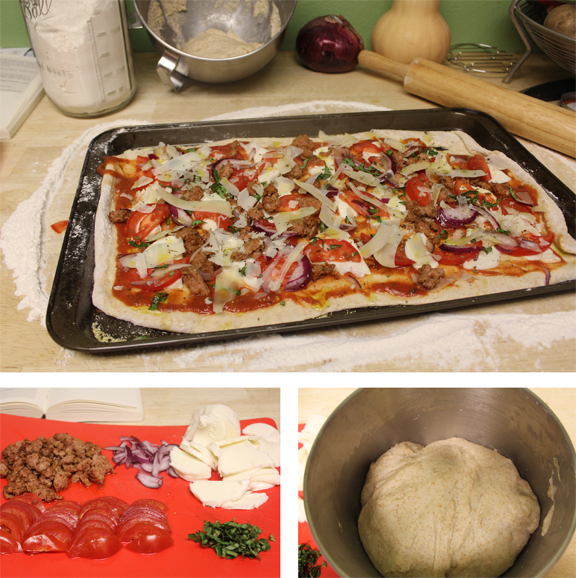 With the second half of the dough, you can, of course, make a second pizza, or you can roll it out, slice it into thin strips and make bread sticks. I rolled out the dough, drizzled olive oil all over it, sprinkled it with garlic salt and the last tiny bit of Parmesan cheese, twisted them up and baked them on a cornmeal dusted baking sheet while the pizza cooked. 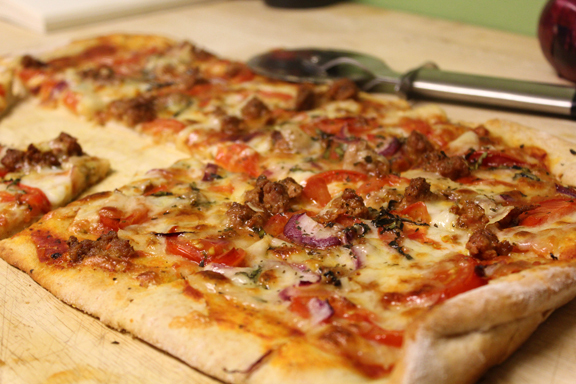 I hope you enjoy some delicious, homemade pizza that takes just a bit longer than delivery. Don't forget to join our email list! Send your name and email address to nopressurecookercontact@gmail.com.